An angle is formed when two rays originate from same end point. The two rays formed an angle are called ‘arms or ‘sides ‘ of the angle and the end point is called the vertex of the angle. Here the rays OP, OQ from an angle denoted by ∠POQ or ∠QOP. The standard unit for measuring an angle is degree. Degree is defined as 360th part of one complete revolution. 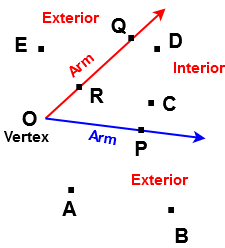 Interior of an angle : The part of the plane which is within the arms of an angle produced indefinitely is called the interior of the angle. 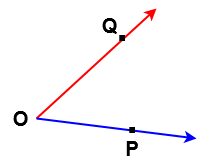 Exterior of the angle: The part of the plane which is outside the arms of an angle produced indefinitely is called the exterior of the angle. The angle is formed by initial and final position of a ray coincide without making any revolution. Thus whose measure is Oo is called zero angle. 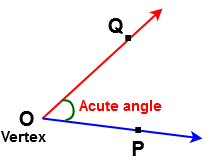 The angle whose measure is less than 90o is called an acute angle. It is also defined as ” An angle which is greater than zero angle bust less a right angle is called an acute angle. For example 35o , 40o , 60o , 70o . . . . . etc are acute angles. In the below figure ∠POQ is called acute angle. The right angle is defined as ” If the initial position of the ray OP is horizontal and it rotates to occupy vertical position OQ then we say that angle formed is a right angle . Thus , the angle whose measure is 90o is called right angle. The angle whose measure is greater than 90o but less than 180o is called obtuse angle. For example 95o , 100o , 120o , 170o . . . . . etc are Obtuse angle. 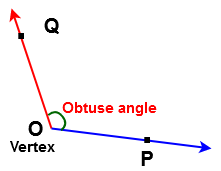 In the below figure ∠POQ is called Obtuse angle. The straight angle is formed when the initial and final position of a rotating ray opposite to each other. 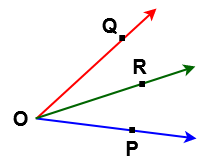 The angle by two opposite rays OP and OQ is a straight angle since they form a straight line PQ and this is half of one complete angle. Thus ∠POQ = 180o = Straight angle. 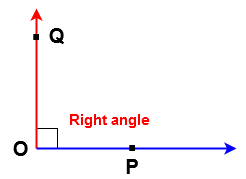 The angle whose measure is more than 180 o and less than 360o is called reflex angle. For example: 200o , 250o , 300o , 350o . . . . etc are reflex angles. In the below figure ∠POQ is called Reflex angle. The angle is said to be complete angle, If an angle id formed by rotation ray, after making a complete revolution, coincides with the initial position. Thus, the angle whose measure is 360o is called complete angle. In the above figure, the arm OP coincide with the arm OQ after making complete revolution. Therefore, ∠POQ = 360o = Complete angle. Thanks for reading this article. 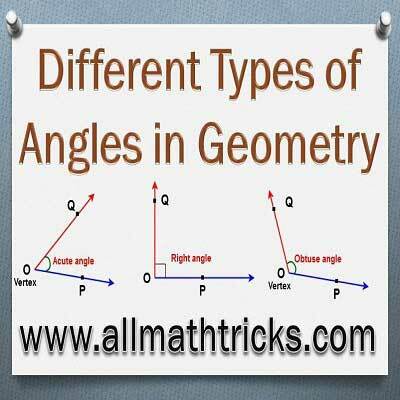 I Hope you liked this article “Different Types of Angles in Geometry”. Give feed back, comments please.